If you are unable to listen from or download Apple Podcasts, click on the link below that will take you to Spreaker.com. Episode 178 is Nick Nudell. Nick has over 25 years of EMS and health care experience and has used his visionary skills to improve health care systems designs and performance. Nick is one of the founders of the American Paramedic Association, which published their manifesto this month. Though this podcast was recorded before the manifesto was made public, we discuss the manifesto, the APA, and other organizations Nick is associated with. Should all EMS providers be called Paramedics? Nick answers this question as well as we discuss the state of EMS and Nick’s cross country travels. Episode 177 is Jan Marks. Jan was born in Pittsburgh and worked for City of Pittsburgh Bureau of EMS for 29 years before retiring due to a disability. Jan started her career on the Southside of Pittsburgh on Medic 8. Jan rose through the ranks and was the first female Field Supervisor for the Bureau promoted in 1987. Jan was a member of the Pittsburgh Public Safety Honor Guard and a dive team member. Jan played a key part of my wedding as she caught the bouquet. Jan and I reminisce about her career, her mentors, being a Paramedic, supervising, and working for the “City”. Episode 176: Who in the public safety arena has not grabbed fast food, sweets, and a sugary drink while on duty? Does the food we eat impact the performance of EMS and Fire personnel? A report from the Ambulance Service Manager Program from Fitch and Associates dives into this subject with “Does Diet Impact Fire/EMS Performance and Outcomes”. Jaime Pospil, James Simmons, and Anthony Minge will let us know the answer to the question and provide insight on how public safety can eat better. Jamie Pospisil is a Captain with Lincoln Fire and Rescue in Lincoln, NE and has been with the agency for 15 years. This experience expands beyond a career department to include ten years of volunteer service at Southwest Rural Fire Protection District. James Simmons is the Director of Marketing and Business Development for Seals Ambulance in Indianapolis, IN. Prior to his current position, he was Seal’s Operations Manager. Anthony Minge is a senior partner with Fitch & Associates. He coordinates the firm’s educational offerings and is responsible for the firm’s reimbursement, compliance, and membership consulting services. We discuss food, the paper, the guest’s career paths, and the Ambulance Service Manager Program. The report is available on the Fitch & Associates website. Episode 175 is Eli Beer. How about reaching a patient in 90 seconds? What if your EMS service is treating over 300,000 patients a year and your EMS service is performing this with 5000 volunteers. Eli is the President and Founder of United Hatzalah of Israel. United Hatzalah has become so successful, as it has been at the forefront of medical innovation. This is what Eli Beer does in Israel, South America, and in the United States. We discuss Eli’s vision is to bring this life saving model across the world. The Ambucycle, a motorcycle that has all the medical equipment of an ambulance aside from a stretcher is one of the innovations that United Hatzalah has created. We talk about this and EMS in Israel in this episode. Episode 174 is Bob Page. If you want to learn or improve upon on EMS topics such as 12-Leads and Capnography and many more while having fun, then Bob Page is the educator and instructor you want. Bob discusses how and why he became the award winning educator as well as we talk about the current EMS state of education. Bob Page is an internationally known speaker, instructor, author, and paramedic. He is recognized for his energetic, humorous and motivational style. Bob takes ordinarily dry and hard to teach topics and transforms them into a fun, learning experience. Bob has been an instructor for almost 4 decades teaching a variety of adult education courses from customer service to advanced medical care. He has presented over 3000 seminars worldwide. He was recognized by his peers in Missouri as Missouri’s “Most Creative Educator” in 2009 and was awarded the Legends That Walk Among Us Award from NAEMSE is 2012. Episode 173 is Miriam Heyman. One of the topics of this podcast over the past 3 years to bring more awareness to suicide within our public safety family and how to recognize and hopefully prevent. This episode discusses a White Paper looking into suicide and mental health of first responders. Would you believe that in 2017, more first responders died of suicide than in the line of duty? Miriam Heyman is a Senior Program Officer at the Ruderman Family Foundation, where she is responsible for the development and oversight of disability inclusion programs. She began her career as a Special Education Teacher in the New York City Public Schools, and while teaching she earned a Master’s Degree in Special Education from the City University of New York. Miriam received a Ph.D. in Applied Developmental and Educational Psychology from Boston College. This podcast hopes to continue the conversation and awareness of this important topic. Episode 172 is Christian Adams and Samuel Adams. The Adams brothers are identical twins, Paramedic/Firefighters, and authors. Their new book “Life and Death Matters” provides an integrated approach to prehospital medicine by incorporating professional attributes, principles of decision making, and medical principles in order to develop first responders and give them the tools for true success in this profession. We discuss their book, career path, being twins, and how to be humble preceptors and paramedics. The book takes a different approach at decision-making and “Life and Death Matters” is available at their website fire-medics.com and Amazon. Episode 171 is Luke Lorentzen. Luke is A documentary filmmaker and his new Documentary Midnight Family will take us through the wild world of EMS in Mexico City. In Mexico City, there is the Ochoa family that runs a private ambulance service competing with others for profit ambulance services for EMS patients. The documentary will take us inside this cutthroat industry and how the Ochoa family struggles to make it in this environment. Luke discusses how he met the family, the idea, how he got the Ochoa’s to agree to let him film and the challenges that came about in the filming. Luke is a graduate of Stanford University Art and Film Studies and has won awards for his filmmaking. The documentary film does not have a release date. Episode 170 is Jeff Robertson. Jeff is the General Manager of Pubilc Safety for RapidSOS. RapidSOS works to integrate a rich data link into every 9-1-1 Center nationwide. Jeff provides us with the interesting story behind the creation of RapidSOS, the technology, real-world use of RapidSOS, and the companies outside of public safety using RapidSOS’s technology. Jeff has 19 plus years in the public safety working with 911 centers. Over the course of his career, Jeff’s roles have included CEO of three 9-1-1 technology companies, executive director and original founding board member of the 9-1-1 Industry Alliance, VP and General Manager of Public Safety for Intergraph, consultant, and author. Episode 169 is David Givot. Our conversation includes his passion for EMS, how he became a fixer for EMS organizations, EMS leadership, becoming a Defense Attorney, and few legal tips. David graduated from the UCLA Center for Prehospital Care (formerly DFH) in June 1989 and spent most of the next decade working as a Paramedic responding to 911 calls in Glendale, CA, with the fire department. By the end of 1998, he was traveling around the country working with distressed EMS agencies. David earned his law degree and is a practicing Defense Attorney still looking to the future of EMS. In addition to defending EMS Providers, both on the job and off, he has created TheLegalGuardian.comas a vital step toward improving the state of EMS through information and education designed to protect EMS professional. David is a member of the EMS1 Editorial Advisory Board. Our conversation includes his passion for EMS, how we became a fixer for EMS organizations, becoming a Defense Attorney, and few legal tips. Episode 168 is Danny Nayman. Danny has been actively involved in EMS and transport medicine for over 15 years; starting his career with West End Fire and Rescue, just outside of Pinehurst, NC in 2000. Danny currently works as a Senior Account Manager for emsCharts. Before joining emsCharts, Danny worked as a Paramedic, Field Training Officer, and an Advanced Paramedic in the Wake County EMS system, as well as the Performance Improvement Officer and Education Program Manager for WakeMed Health and Hospitals. Danny talks about his start in EMS, how he ended up at Wake County EMS, his approach to QI/QA, and documentation. It was nice catching up with Danny. Episode 167 is Kevin Bell. As winter is upon us, Medic2Medic takes you to the warm Bahamas to speak with Kevin Bell. Kevin has been involved with EMS full- time for 29 years. Kevin’s mission since starting in EMS is on enhancing the pre-hospital care system in the Bahamas through development, quality education, training, and technology. Kevin currently holds a degree in Emergency Medical Services, pursuing a second degree and has a number of instructor certifications. He is currently licensed by the State of Florida as an EMT & Paramedic, the Bahamas Health Professions Council as a Paramedic, and Caribbean Emergency Service Registry as a Paramedic. In February he was credentialed as a Fellow in the American College of Paramedic Executives. Kevin is currently managing a Resort Based EMS system in the Bahamas. Through our discussion, Kevin provides an insight into EMS in the Bahamas, the entities that provide EMS, the role of the Health Council, and his EMS journey. Episode 166 is Scarlett Lewis and a different podcast for you and me. Scarlett is the mom of Jesse Lewis who was killed in the Sandy Hook Elementary school shooting 6 years ago. That day in December Jesse alongside 19 classmates and six educators lost their lives in a mass shooting. ‪Scarlett takes us through that tragic day from sending Jesse to school, leaving work after hearing about the shooting, arriving back at the school, the meeting place for the parents with missing children, which was a firehouse. Scarlett provides intimate details of this as well as Jesse, JT (Jesse’s older brother) and insight to the Sandy Hook community. We also learn how forgiveness and love play an important role in her life today. A message left behind by Jesse would lead to the Choose Love Enrichment Program founded by Scarlett. The Choose Love Enrichment Program is a no-cost Pre-K through 12th grade social and emotional learning program that teaches educators and their students how to choose love in any circumstance and helps them become connected, resilient, and empowered individuals. You will want to hear her story and how inspirational Scarlett and the Choose Love Movement are. Episode 165: Mike Taigman joins me again to discuss the EMS Agenda of 2050. Some 20 years ago EMS as an industry introduced the EMS Agenda for the Future. DId EMS as an industry accomplish the agenda items spelled out 20 years ago? Mike revisits and provides insight to a few of these items. Mike talks how he became involved with 2050, the process to develop 2050, and laying the framework the future of EMS in 2050. Episode 164 is Mike Rubin. Very rarely you hear of someone making EMS a second career. Mike Rubin is one of those rare people that EMS is his second career. In 1995, after 21 years in business, Mike began a second career in EMS. Mike was hired by NY State as a paramedic and instructor at Stony Brook University. In April 2001, he was promoted to Supervisor of Suffolk County Medical Control, a position that allowed him to utilize his EMS, business, systems, teaching and management experience. Mike relocated to Nashville, where he spent six years as a paramedic at the Opryland entertainment complex. Mike began writing for major EMS media, created the EMS version of Trivial Pursuit and produced Down Time, an album of rescue-oriented rock and pop tunes. We talk about his path into EMS, writing for the EMS industry and Trivial Pursuit. Episode 163: Ryan Lewis is a North Carolina native who found his calling in emergency services through the TV show “Emergency!” He currently serves full-time as a District Chief with Wake County EMS. Since beginning as a fire service explorer scout in the 1980s, he has served in almost every role at both volunteer and career fire and EMS organizations, in areas from rural to urban, and in locations from North Carolina to Texas. Though he considers himself a Tar Heel through-and-through, he graduated a Cowboy from Oklahoma State University, receiving a Bachelor of Science in Fire Protection and Safety Engineering Technology before returning for his Master of Science in Fire and Emergency Management Administration. We talk about leadership, research, his supervision style, Texas EMS, and how a Tar Heel becomes a Cowboy. Episode 162 is Gary Ludwig. There is so much talk, questions, and articles written about should college degrees be mandatory for EMTs and Paramedics? This week on Medic2Medic Gary and I dive into this topic. Gary is the fire chief for the City of Champaign, Illinois. Gary has been a paramedic and leader in both EMS and fire for over 39 years. Gary and his team when he was with Memphis and St. Louis EMS systems were recognized nationally with awards. Gary has written over 500 articles for EMS and fire journals and speaks nationally at conferences. Gary and I discuss his article and his thoughts on degrees, leadership, and his career. Episode161 is Dave Zaiman. Dave has been working in the emergency medical field for more than 30 years and joined ImageTrend 13 years ago, bringing his vast experience with EMS and technology. As ImageTrend ’s product sales manager, he has overseen trauma, emergency preparedness, and state and service EMS implementations and serves the leader for ImageTrend’s mobile healthcare initiatives CrewCare and Continuum project. CrewCare is an APP for first responders and was created in response to the growing concerns on mental health for first responders. One of the APP’s goals is to provide mental health insight on an individual stress load. Listen to Dave explain the beginnings of the APP and the benefits of having this APP on your phone. Episode 160 is Tim Nowak. Tim is the founder & CEO of Emergency Medical Solutions, an independent EMS training & consulting company that he developed in 2010. He began his EMS journey in 2002. His career formally began in Wisconsin as a full-time firefighter/paramedic with the state’s 3rd largest department and has since transitioned into an educator & agency representative role for a hospital system in Colorado. He’s also been involved in EMS training program development and course delivery throughout much of his career, including operating his own company. In addition to teaching, Tim has been a board member, is a contracted item writer, a columnist with EMS1.com, has his own podcast called EMS Insight, and is the Editor-in-Chief of the EMS Director, a printed publication dedicated to professional development in EMS. Tim is known for his thought provocating questions, opinions, and answers on LinkedIn regarding EMS. We talk about this subject, EMS education, consulting, EMS1.com and his entrepreneurial spirit. Episode 159 is Robert McCaughan and Todd Pritchard talking about a new EMS Reimbursement Pilot project being conducted in Pittsburgh. Bob and Todd take us through the steps from concept to implementation. The project is a collaboration between hospitals, EMS and health insurance to provide reimbursement to EMS when patients are not transported. Bob is the Vice President of Prehospital Care Services for the Allegheny Health Network. Bob was an original member of the City of Pittsburgh Bureau of Emergency Medical Services when it was established in 1975. Retiring as Chief from Pittsburgh EMS in 2012, he joined Pittsburgh-based Highmark Health as Vice President of Prehospital Care Services before moving into his current position. Todd is the Chief of Medical Rescue Team South Authority and the Chairperson of the Allegheny County EMS Chiefs Association. Todd began his career with MRTSA as a volunteer in 1985 after graduating from California University of Pennsylvania. Todd was promoted to Chief of MRTSA in 2007. Episode 158 is Peter Fischer. Peter E. Fischer MD, MS is an Associate Professor of Surgery at the University of Tennessee Health Science Center in Memphis, TN. Prior to and during residency, he worked as a Firefighter/Paramedic. He was previously at Carolinas Medical Center in Charlotte, NC before returning to Memphis in 2016. He currently serves as the Director of Trauma Process Improvement, Interim Trauma Medical Director, and Interim Chief of Trauma at the Elvis Presley Trauma Center. He also is the Medical Director for Hospital Wing Air Ambulance Service. He has a strong clinical and research interest in prehospital and trauma system development. Our discussion spans from the new position statement regarding Spinal Motion Restriction in the Trauma Patient, the use of the backboard, EMS, and even a little Elvis. Episode 157: The Three Year Anniversary Podcast. Erin Cohen takes on the hosting duties for this podcast. Erin talks to me about the creation of the podcast, my career, and I answer questions sent in by the listeners and guests of the podcast. Three years ago a little podcast was launched and 157 episodes later I want to say a big thank you for listening. To my guests who tell their stories, educate us, and dedicate themselves to this profession you have my deepest admiration and thanks. Episode 156 is Arthur Caplan and medical ethics and the cost of an ambulance transport are the topics this week. Arthur is a regular commentator on bioethics and health care issues for WebMD/Medscape, WGBH radio in Boston, and WMNF public radio in Tampa. He appears frequently as a guest and commentator on various other national and international media outlets. Arthur is currently the Drs. William F. and Virginia Connolly Mitty Professor and founding head of the Division of Medical Ethics at NYU School of Medicine in New York City. Prior to coming to NYU, he was the Sidney D. Caplan Professor of Bioethics at the University of Pennsylvania Perelman School of Medicine in Philadelphia, where he created the Center for Bioethics and the Department of Medical Ethics. He has served on a number of national and international committees including as chair of the National Cancer Institute Biobanking Ethics Working Group, chair of the Advisory Committee to the United Nations on Human Cloning, and chair of the Advisory Committee to the Department of Health and Human Services on Blood Safety and Availability. He has also served on the Presidential Advisory Committee on Gulf War Illnesses. In our discussion, Arthur defines medical ethics, provides tips on how to stay out of trouble and what to do when ethics may get in the way. Arthur speaks about the problem with ambulance billing and solutions to solve the issue. Episode 155 is Douglas Randall. Douglas is currently serving as Division Chief of EMS at the Plainfield Fire Territory in Plainfield, IN. He successfully obtained this position after working 20 years in the City of St. Louis, most of the time spent as an EMS Training Officer of over 800 Paramedics, EMTs, and Firefighters. He is a Nationally Registered Paramedic with a Bachelor’s Degree in Business Management. Douglas was hoping to head to medical school and then circumstances that you will hear lead him to his career in EMS. Douglas speaks candidly about his early years and the struggles he faced as a new paramedic and the obstacles that confronted him. Douglas talks about the lessons he learned and how he leads today. Douglas also tells us how important learning is to him. Episode 154 is Peter Antevy, MD. Peter is a Pediatric Emergency Medicine physician practicing in-hospital emergency medical care at Joe DiMaggio Children’s Hospital in South Florida. Peter is Board-certified in pediatrics, emergency medicine and the complex subspecialty of EMS, he is also the founder of Pediatric Emergency Standards, Inc., and he serves as the Medical Director for Davie Fire-Rescue, Coral Springs-Parkland Fire Rescue, Southwest Ranches Fire Rescue and American Ambulance. Peter is perhaps best known for revolutionizing pre-hospital pediatric care by re-setting the boundaries of patient care standards for children and for challenging current conventional wisdom with his pioneering Handtevy Pediatric Standard Program and videos. Of significant note, in 2017, he was awarded the prestigious Ron J. Anderson Memorial Award in Dallas, TX, the international public health service accolade bestowed for his far-reaching public health contributions in emergency medical care, particularly for his efforts to improve outcomes for critically ill and injured children. At the same time, Peter remains a grounded, in-the-trenches EMS medical director as exemplified by his recent involvement in on-scene patient care at the Parkland, Florida high school shooting incident and, in turn, his connected follow-up of patients, families, and rescuers. Peter, as you will hear during our talk, does not take “no” for an answer. We discuss the reason why he chose Pediatrics as a specialty and how he became involved in EMS, which is a great story. We touch briefly his role in the Parkland event and how the crews are doing today. In EMS a pediatric call usually sends chills up our spines and Peter sets out to answer why this occurs and provides a solution. Peter is an extraordinary person and I believe you will feel the same way after this podcast. Episode 153 is Todd DeVoe. Todd started his career in the public safety profession as an EMT in Upstate New York in 1988. Todd joined the United States Navy in 1991 and served as a Fleet Marine Force (FMF) Corpsman from 1992-1997. After his time in the Navy, he used his GI Bill and completed his B.S. In Public Administration and then his Masters of Public Administration. Todd’s primary role in the field of Public Administration has been in Emergency Management. More recently Todd has been working for the Saddleback College Police Department as the Emergency and Business Continuity Manager and a small Lutheran College in the Campus Safety Department as their emergency manager. Todd is also the host of the EM Weekly Podcast which focuses on bringing news, interviews discussing trends and issues that impact Emergency Management. Our discussion includes Todd’s introduction to emergency services and why helping people was and still is important. We talk about his military service, his first EM incident that he was part of, his podcast and that EM is more than managing and being part of major disasters. Episode 152 is Kate Dernocoeur. Kate is a fascinating and energetic person to have on a podcast. Kate is a NREMT, has written numerous books, articles, and columns, particularly for EMS readers. Her involvement with emergency care began in 1974, and she served with Denver’s famous Paramedic Division from 1979 to 1986. She is now an EMT-firefighter with Ada (MI) Fire Department and a SARTECH-II with Kent County SAR’s K9 Unit. The 4th edition of her seminal book, Streetsense: Communication, Safety, and Control is scheduled for release in 2019. We talk about her path, why she likes EMS, writing and how StreetSense came about as well as some of her mentors. This episode is sponsored by Erin Cohen from Fathom Realty. Episode 151 is Drew Dawson. Drew is the Interim Executive Director of National Registry of EMTs. Drew has a long career of public service which started in his home state of Montana. He was a volunteer EMT and Director of the Boulder, Montana Volunteer Ambulance Service for many years. Drew served as Montana’s State EMS Training Coordinator for several years and as the Montana State EMS Director. Drew was not done as he moved to DC to the National Highway Traffic Safety Administration where he oversaw the emergency medical services activities of the National Highway Traffic Safety Administration. We talk about his long career, what it is like to work for NHTSA and the other programs NHSTA is involved with. We spend time discussing his work in his current role at the NREMT and why we all should be nationally registered. Episode 150 is Gregg Margolis. Gregg is the Director of Health Policy Fellowships and Leadership Programs at the National Academy of Medicine (NAM). In this role, Gregg leads the NAM’s four national health policy fellowship and scholar programs with a mission of building health policy leadership and expertise for the future. Prior to joining the NAM, Greg served as the Director of the Division of Health System Policy for the Office of the Assistant Secretary of Preparedness and Response at the US Department of Health and Human Services, where he led a team of policy experts in formulating, analyzing, and implementing policies to build strong, integrated, and resilient healthcare systems that are prepared for, able to respond to, and recover quickly from disasters and public health emergencies. Way, before briefing White House officials and working as the Associate Director NREMT he gave this podcast host a shot at writing at the national level. Gregg asked me to be part of writing and editing the national EMT-I curriculum. Even before that Gregg and I met when he was a paramedic student at the Center for Emergency Medicine In Pittsburgh. Gregg has over 20 years has clinical and flight paramedic, educator, author, speaker and holds a Ph.D. in administrative and policy studies and an MS in health care supervision and management from the University of Pittsburgh. Gregg continues to work to make this the world better for EMS and to improve the health of others. We talk about this fantastic career, his scuba diving, visits to the White House, and our Pittsburgh connection for this 150th episode. Episode 149 is Kendra Hicks. Kendra is a 10-year veteran in EMS and for the last 8 years a Paramedic for Wake County EMS and the Wake County EMS System. Kendra is a recent graduate of Campbell University earning her degree in Psychology. Kendra discusses her entry into EMS, love for EMS, balancing school and work, memorable calls and partners. During our podcast, you will hear Kendra’s passion for being a Paramedic, taking care of patients, and working for Wake County EMS. Episode 148 is Steve McGhie. Steve is the General Secretary of the Ambulance Employees Australia-Victoria. Steve is a long history in EMS and being involved in the Union that protects the 4,100 plus EMS employees in Victoria. Did you know that the CDC reported in 2014 that 2,600 EMS workers received hospital treatment from being injured from an assault? Did you know that 75% of EMS providers reported some type of violence had occurred to them over the past 12 months? Violence against EMS providers continues to rise. Steve and I talk about this issue and how an incident in Australia has sparked a change to mandatory jail time for the person or persons that assaults the provider. We talk about ways that we can try to prevent the violence from occurring. Episode 147 is David Fifer. David is EMS Educator at Eastern Kentucky University and a fellow podcaster as he is the co-host of the Raw Medicine Podcast. When he is not teaching he is involved with the Red STAR- Red River Gorge Special Treatment, Access and Rescue. Red STAR is the volunteer ALS wilderness special operations unit of the Powell County Ambulance Service in Kentucky’s Red River Gorge. David has always been interested in EMS, helping others and learned this at an early age. We talk about his career path, which was not always EMS, the current state of EMS education, and David and I discuss the value of EMS providers obtaining a 4-year college degree. This episode is sponsored by Erin Cohen Fathom Realty. Episode 146 continues this podcast’s continuing spotlight on the wellbeing of the people in public safety. This week Daniel and Ann Crampton, the founders of Status: Code 4i (SC4I) are the guests on Medic2Medic.SC4I was created following the numerous reports of First Responder suicides across the United States and Canada. SC4I is in the unique position to intimately understand the stressors associated with being a First Responder. Their mission is to provide counseling and mental wellness education services to First Responders and their family members. Daniel J. Crampton holds a Doctorate in Psychology and has served as a Paramedic with the Ute Pass Regional Ambulance District for over 23 years. Daniel’s Doctoral Dissertation is titled, “Comparison of PTSD and Compassion Fatigue between Urban and Rural Paramedics”. Ann Rush Crampton holds a Ph.D. in Education specializing in Training & Performance Improvement. She is a retired U.S. Air Force officer, and she has spent over 30 years performing duties as an adult educator. While in the Air Force, she was on several Crisis Support Teams and provided Suicide Awareness Training. Daniel talks about his journey and difficult times and Ann tells why including the family in the process is important. Episode 145 is Mike Pertz. Mike is on a mission to help EMS providers decrease the pediatric medication errors. Mike founded SmartSquad that is dedicated to creating products and software for EMS/Fire community to help with this mission. Mike is career Firefighter/Paramedic for fire department just outside of Cleveland, Ohio. He played professional soccer before entering the world of public safety. Mike is also the founder of FirefighterNOW a site dedicated to giving aspiring firefighters the best and most affordable tools to ace their entry exam and interview. Our discussion talks about his journey from soccer player to Firefighter/Paramedic and why he choose the profession. We talk about his entrepreneur spirit and what inspired him to create SmartSquad and FirefighterNOW? Episode 144 is Rhonda Kelly. Rhonda is the Program Manager for ResponderStrong. ResponderStrong is an organization committed to the notion that mental resiliency is vital to the overall performance and wellbeing of emergency responders. Rhonda’s path to ResponderStrong is unique, fun and interesting. Rhonda goes from nursing to working on a research vessel to EMS and Firefighting. We talk about her journey, the mission of ResponderStrong and the innovative use of virtual reality to train and assist responders on how to handle stressful situations before they occur. It is an interesting vision and project that ResponderStrong is undertaking. Episode 143 goes law enforcement with Chief Tony Godwin of the Cary Police Department. Chief Tony Godwin began his career with Cary PD in 1990. Chief Godwin has had the opportunity to serve in many different roles through the years, including Emergency Response Team Sniper/Sniper Team Leader/Team Commander, Bike Team Sgt., Undercover Narcotics, Criminal Investigations Lieutenant, Major over both the Operations and Services Bureaus, Deputy Chief of Police and now Chief. The Chief was one of the first police officers I met when I arrived at Cary Area EMS. I invited Chief Godwin to talk about the opioid crisis and how his department is working through the problem. We also talk about his venture into law enforcement and he tells a good story about his days undercover. Episode 142 is Dr. James Woodson. James is the founder and Medical Director of Pulsara. Pulsara is a care coordination company focused in the acute care setting of healthcare. Pulsara set out to answer the following questions: How can we improve patient care in our facilities? How can we help our healthcare system pursue improved quality of care at a lower cost? James states that he is a start-up entrepreneur stuck in an Emergency Medicine Physician body. After completing his Emergency Medicine specialty training at Carolinas Medical Center. James joined Leading Edge Medical Associates. James is a frequent contributor to JEMS and was named an EMS 10 Innovator in 2016. Around 5 years ago he and his family left their home in Texas and moved to Bozman, Montana to launch Pulsara. Our conversation takes us on this journey and his path into Emergency Medicine. James discusses his special interest in decreasing medical errors and written about this topic. We discuss the good and the bad about technology that is used in EMS. We also spend time talking about Pulsara’s mission. Episode 140 is Scott Sampy. Scott and I go way back to our days at Zepfel Ambulance. We almost went to nursing school together. He did and I went to work for the City of Pittsburgh. Scott is currently the Administrator of Vidant EastCare, the 5 helicopter, 22 ambulance medical transport division at Vidant Medical Center, which is the only level one trauma center in eastern North Carolina. Scott has more than 40 years of clinical, leadership, and educational experience in the air medical and ground transport industry. A western Pennsylvania native, Scott began his career as an EMT then Paramedic and RN and later received a BA degree in Legal Studies from the University of Pittsburgh and a Masters of Management and Technology degree from Carlow University. After finishing nursing school he worked at the WVU and UPMC Presbyterian Hospital emergency departments, then became a flight nurse at STAT MedEvac. In addition to his professional career, in his spare time, Scott has volunteered as a firefighter at several fire departments, rising to the rank of Chief at the Marshall Township Volunteer Fire Department in Pennsylvania. Scott discusses his career, his first day as a flight medic, and ins and outs of the air ambulance industry. We had fun catching up. Cabinet of Nova Scotia, Dr. Stewart has focused his career on health system excellence. Educated at Dalhousie University and the University of Southern California. His career has ranged from general practice in a Nova Scotia coastal fishing village, staff positions at several noted medical schools, and the Medical Director of the paramedic system of the City of Pittsburgh. Dr. Stewart was my first medical director when I work for the City of Pittsburgh. His work in medical research has been recognized in the United States through the creation of the Ronald D. Stewart Chair in Emergency Medicine at the University of Pittsburgh and in 2009 the American College of Emergency Physicians named him a Hero of Emergency Medicine.The Canadian Health Association honored him in 2013 as the recipient of their Distinguished Service Award for work in improving the health system in Canada, humanitarian service abroad, and his part in the creation of a new medical specialty emergency medicine. He has received the James O. Page Award in the United States, recognizing lifetime achievement in Emergency Health Services in America and throughout the world. We talk about his amazing and astonishing journey and of course we talk his role in Emergency! I am humbled and lucky to have had the opportunity to record this podcast. I am not sure were EMS and Emergency Medicine would be without Dr. Stewart’s contributions and wisdom. Episode 138 is Jack Glass. Jack like so many of us in Pittsburgh started as a volunteer and then being paid at Zepfel Ambulance Service before moving to the City of Pittsburgh Bureau of EMS in 1978. Jack, now retired played a significant role in each area he worked for the City. Jack started in the Ambulance Division but spent most of his career in the Rescue Division. How did he end up in the Rescue Division? It is a good question and Jack was surprised too when this occurred. Jack will take us through his career and the positions he held as well as Jack will take us inside some of his rescues. Jack is a National EMS Memorial Service board member (emeritus). Episode 137 is Hilary Gates. Have you attended an EMS National Conference? Did you ever wonder how one is put together or how the conference chooses the city to hold the conference? Hilary Gates is the Program Director for EMS World Expo. She is also a volunteer paramedic in Alexandria, VA, where she began the department’s community paramedic program. She is an EMT Instructor and teaches in the School of Education at American University. She began her career as a volunteer EMT with the Bethesda-Chevy Chase Rescue Squad in Montgomery County, MD. Hilary will answer the above questions and tells us what is like for her a few days before EMS World Expo starts. We also discuss what led her to EMS World, community paramedicine and what EMS in 2018 will bring. Episode 136 is Avi Golden. Avi was a Paramedic and his plan was to attend medical school. In early June 2007, at 33 years of age, Avi was admitted to Columbia Hospital, in New York, for surgery for a mitral valve prolapse repair that was discovered near the aortic valve in his heart. Like many people who go to the hospital for serious, but seemingly routine, surgery, Avi thought he’d be out and recovering in short order. However, that was not to be. During the surgery, Avi experienced a stroke on the left side of his brain, leaving him with right-sided paralysis, and profound aphasia, which proceeded to wreak havoc with his life. Did this stop Avi? Avi tells his story about his stroke and the effects of suffering from Expressive Aphasia. Avi still has balance problems and weakness on the right side of his body, but it’s his Expressive Aphasia that frustrates and confounds him more than any of his other post-stroke residuals. Avi can understand what people are saying to him and he can still read quite well. However, he continues to have a lot of trouble speaking and writing. This can be devastating for any friendly and outgoing person. Avi refuses to let aphasia get in his way. Avi is an EMT and more importantly, he’s embarked on a new mission of “aphasia advocacy,” educating others about aphasia and how it impacts a stroke survivor’s day-to-day life.To make this new goal a reality, Avi has been involved in a lot of aphasia-related projects. Like the myriad of activities in his pre-stroke life, he’s done so many things since his stroke like snowboarding, skiing, and scuba diving to name a few. Avi is joined by Katlin Brooks, who is a Speech Pathologist and Professor at Mercy College. Katlin works with Avi and she tells how they met and explains the art of speech pathology. Episode 135 is a Film Documentary called Trauma. Trauma depicts the heroism and struggles of a medevac unit in Afghanistan and their lives afterward as they deal with PTSD and other challenges. Medic2Medic speaks with Harry Sanna who is the DIrector and Ryan Cumminham the Producer. Harry is Australian journalist and filmmaker who was based in Afghanistan between 2009 and 2011. In early 2011, Harry was embedded with the C Company Dustoff, Mountain Division, 3-10 GSAB medevac unit at FOB Shank in Logar Province, Afghanistan. Harry intensively filmed the time he spent living and flying alongside a Blackhawk medevac platoon, capturing daily life on base and on missions and befriending the medics. Harry also has contributed articles to TIME Magazine and the New York Times. We talk about the access that Harry (Harry was in Australia when we recorded) had and how he gained the trust of the Soldiers. We talk about how the idea came about and how Ryan and his production team got involved. The stories and struggles the Soldiers tell are gripping. Harry tells about his struggles after how that led to the additional storyline. Host Note: Trauma is a powerful film and left an impression on me. I believe that the stories told here, those of us in public safety will relate and understand. The film is available on iTunes and Amazon. Episode 134 is Vince Mosesso. Vince is an Emergency Medicine Physician with 27 years of experience. Vince is the Medical Director for University of Pittsburgh Medical Center Prehospital Care, Associate Medical Director for the City of Pittsburgh Bureau of EMS, a professor of Emergency Medicine for the Universtiy of Pittsburgh and has a passion for EMS. I ask Vince how did he go from studying to be a priest to EMT, Paramedic, and Physician? We discuss the challenges of EMS, being a Medical Director and working with EMS icons Dr. Ron Stewart and Dr. Paul Paris. Episode 133 is Dan Patterson. Dr. P. Daniel Patterson studies safety in emergency care settings with special emphasis on safety culture, fatigue, shift work, sleep health, teamwork, medical errors and adverse events, and clinician injury in the prehospital EMS setting. Fatigue in EMS is a hot topic. EMS fatigue is a common workplace problem. The number of EMS fatigue-related occurrences involving EMS personnel and their patients is on the rise. Some of the most recent research shows that more than half of emergency medical services personnel report severe mental and physical fatigue while at work. What is the right shift? Are EMS leaders prepared and educated to handle this problem? This week Dan discusses the findings after his team of co-investigators reviewed over 38,000 pieces of literature to develop guidelines on this important subject. We discuss the 5 recommendations and what are the next steps in this project? Episode 132 is Zach Almond. Zach is a Paramedic for the London Ambulance Service. Believe it or not, Zach is from Texas. In this podcast, you will find out the interesting path Zach takes to ends up in England. This includes his love for music, playing in a band, his spark to enter EMS and where he studied to become a Paramedic? Zach answers what it is like to be a Paramedic in London, delivering his first baby and his love for adventure. Episode 131 is Dena Ali. Dena is a 10-year member of the Raleigh Fire Department, which she is a Captain. Dena also works in EMS and started her public safety career as a Police Officer. Dena has personally experienced the benefits of peer support and recognizes how critical it is to simply be heard and understood.You will hear Dena’s passion about the well being of all of us in public safety and her effort to prevent suicides by Firefighters, Police Officers, Paramedics, Advanced EMTs, and EMTs. We talk about her fascinating journey, why all the above is important and the new Peer Support Team for Public Safety that she is a founding member. If you need help or need someone to talk to you can call 855-7NC-Peer (855-762-7337) anytime. Episode 130 is Simon Taxel a Paramedic Crew Chief with the City of Pittsburgh Bureau of EMS. Simon is also on the Dive Team, a medical specialist on the Pennsylvania urban search and rescue strike team as well as a contributing author for JEMS and CE Solutions. He started his EMS career 14 years for Meadville Area Ambulance Service. After receiving his bachelor’s degree he moved to Pittsburgh to attend Paramedic School at Community College of Allegheny County and went to work for the City of Pittsburgh. Simon, as mentioned above is a frequent contributor to JEMS and his article on employee retention caught my eye. We discuss this article as well as others, his start in EMS, City of Pittsburgh EMS, the cold rivers of Pittsburgh and how he becomes involved in writing articles for JEMS. Episode 129: Uber versus Ambulance. Which one would you call if you were having a heart attack or a sprained ankle? David Slusky, Ph.D., is an Assistant Professor of Economics and an Oswald Scholar at the University of Kansas, where he also co-directs the Health Policy Research Group and is a faculty affiliate of the Institute for Policy & Social Research. David and his co-author Dr. Leon Moskatel take a look at what Uber has done to ambulance calls in cities across America. David discusses how the idea came about, methods and the surprising results of the research. Our conversation also leads us to what may be the next step with this research? This episode is sponsored by The Pulse Point Foundation. Episode 128 brings back the editors from EMS1.com and JEMS to the podcast. Greg Friese and AJ Heightman join me to talk about their picks for the impact stories in 2017. Both AJ and Greg offer their insight into the stories as well as they give you a peek into the stories in 2018 that will be of interest. All of us had a spirited discussion and it was a fun podcast to produce. Enjoy and Happy New Year from Medic2Medic. Episode127 is Jon Politis. I could tell you that Jon retired from EMS and Public Safety after starting his career in 1971. I would be not telling you the truth. Jon is an engaging educator who has presented at many state and national conferences across the US and Canada. Jon has served in many capacities: firefighter, ski patroller, Paramedic, Paramedic Program Coordinator, State EMS Training Coordinator and EMS Chief. He was the first Chief of EMS of the Town of Colonie EMS Department Jon continues to practice as a Paramedic, continues as an active volunteer firefighter and alpine ski patroller. In the summers he works as a Seasonal Ranger/Paramedic in Grand Teton National Park, Jackson Hole, WY. Jon and I talk about bringing 6 EMS agencies into one, leadership, politics, ski patrol and his Boot Camp Educational Program for supervisors. Episode 126 is Benjamin Currie. Benji is an EMT-P, currently serves as a District Chief for the Wake County EMS Advanced-Practice Paramedic (Community Paramedicine) program for the Wake County EMS System. He graduated from the inaugural APP academy administered by Wake County and spent three years functioning in the street as an advanced-practice paramedic. Since being promoted to supervisor, he serves as a front-line asset that also works with program managers within the community who serve high-risk patient populations to coordinate and facilitate care and increase collaboration between multidisciplinary agencies. Benji is a believer in Peer Support and a leader in the Wake County EMS System Peer Support Team. During our talk, you can hear Benji’s passion regarding Peer Support and how important this is to him. We also discuss a few other EMS related topics. Episode 125: Greg Mears, MD serves as the Medical Director for ZOLL, providing clinical guidance to ZOLL’s Data and Resuscitation Divisions. Greg has been an Emergency Medical Services Physician, educator, and specialist in performance improvement for more than 25 years. His passion is building integrated systems of care and for using real-time data to drive EMS operational and clinical decisions. Greg is the recipient of the Journal of Emergency Medical Services as a Top Innovator in EMS. Prior to joining ZOLL, Dr. Mears was a Professor of Emergency Medicine at the University of North Carolina at Chapel Hill and the North Carolina State EMS Medical Director. EMS Agenda 2050, being a State EMS Medical Director, his responsibilities at ZOLL and his love of data and information are some of the topics we discuss. We also touch on the National EMS Information System (NEMSIS), which Greg was a key player. Episode124: Charles A. Blankenship is the Manager of System Transport for Mission Health System in Asheville, North Carolina. Charles has over 25 years of EMS experience that includes being a Critical Care Paramedic and being an officer from American College of Paramedic Executives. Charles is the Chair of the Accreditation Committee for the National EMS Management Association. We talk about his military career, why EMS, how he ended up in North Carolina and how he leads 5 different departments. Episode123: Colene James joins me this week. Colene is a former volunteer and full-time employee at Cary Area EMS. Colene has over 10 years of EMS experience. She began her career at Florida State University’s Medical Responder Unit where she quickly moved up the ranks to serve as Director of Operations, EMT Field Supervisor, and Teaching Assistant. She has served with three different Counties in Florida before arriving at Cary Area EMS. She is currently working as a paramedic in a local ER in Salt Lake City, UT. We talk about her experiences and her attempt to become an American Ninja Warrior. Episode122: Richard Price is the Founder and President of the PulsePoint Foundation.The foundation provides a suite of mobile apps designed to support public safety agencies working to improve cardiac arrest survival rates by using technology that sends nearby citizens trained in CPR to the scene. Listen how a retired Fire Chief goes from fighting fires to the tech world and the story/call that inspired Richard to start PulsePoint. Episode 121: David Hunnicutt and Christian Bennett from Cary Area EMS are the guests this week. Both are full-time Paramedics with Cary Area EMS and both have traveled to Ecuador with students from North Carolina State Universty on a medical mission. We hear about their experiences and challenges that they faced in Ecuador as well as their unusual paths that lead them into EMS and to Cary Area EMS. Episode 120: John Feal. What do you think when you hear the words First Responders? Do you think EMS, Fire or Police? This week I talk to another First Responder who is not in public safety and was a first responder who was at Ground Zero. On September, 12th 2001 John and his team were ordered to report to Ground Zero in order to aid in the cleanup and recovery mission following the terror attacks. Without hesitation and with a sense of pride in serving his country in a time of need, John and his team reported as ordered. Tragically, on John’s fifth day on site, he became the one that needed aide. While supervising his team a steel beam weight approximately 8,000 pounds came loose from the huge pile of debris, crushing John’s left foot. Jon Feal’s story is unbelievable and his story at Ground Zero has led him down a path that he never knew he was on. Subsequently, John went through years of surgeries and innumerable hours of therapy; as well as extensive stays in the hospital for follow up treatments. John quickly learned the multitude of bureaucratic horrors that come with being severely injured He experienced hurdle after hurdle with mounting medical bills and no income. Fed up with hearing the word ‘No’ from insurance companies, doctors, and elected officials, John decided that no American should be treated so egregiously, especially those that had come to this country’s aide in its greatest hour of need. Once out of the hospital John made it his mission to help alleviate the many obstacles he had endured e founded The FealGood Foundation (FGF). Through its grassroots fundraising, the FGF has raised and donated millions of dollars to individuals gravely affected by the aftermath of the September 11th attacks. Oh by the way when he is not pestering politicians, he found time to donate a kidney. We tell his story this week on the podcast. Episode 119: Michael Bachman has been a paramedic for over 24 years and is currently the Deputy Director of Medical Affairs for the Wake County EMS system. Michael is responsible for the 911 response, clinical quality, performance improvement, research, and data analysis. Prior to this appointment, Michael held various positions in EMS to include Field Training Officer, District Chief and Clinical Educator. In addition to his responsibilities for quality assurance and data management, Michael oversees the implementation and delivery of the Advanced Practice Paramedic (APP) program for the Wake County EMS system. Our discussion includes Michael’s early days in EMS, where you had to call for an IV, his track to Wake County, research, the future of EMS and an inside look at the Office of Medical Affairs. Episode118: Jon McCarthy is the author of Hard Roll: A Paramedic’s Perspective of Life and Death in New Orleans. Jon began his public service as an active duty member of the United States Coast Guard. Six years later, he entered the world of emergency medical services and has worked for 20 years as a paramedic. He is one of the architects of the New Orleans EMS Field Training Officer program. The book gives readers an inside look into the chaos of EMS and the toll the job of a first responder takes on those who serve. We discuss his path into EMS, a mistake that almost cost him his career, the book and if there will be a sequel to Hard Roll? Episode 116: Pittsburgh Emergency Management Retired Deputy Director Ray DeMichiei has 42 years oF public safety experience. His introduction to the importance of emergency management in his local community of Plum Boro was in 1972; where, as a volunteer firefighter, his first call was a three-day response to the aftermath of Hurricane Agnes. Deputy Director DeMichiei became involved with Emergency Medical Services in 1973in Plum Boro outside of Pittsburgh. He was certified as an EMT-2 in May of 1975 and employed by the City of Pittsburgh Emergency Medical Services in June that same year. He put Pittsburgh Medic 2 in service for the first time on September1, 1975. During his EMS tenure he was assigned to Rescue 2 was promoted to Crew Chief and worked at Medic 5, Medic 1 and Rescue 1. June of 1986 saw Deputy Director DeMichiei assigned to the Pittsburgh Public Safety Office of Professional Responsibility as in investigator. In 1988 he was assigned to the Bureau of Communications 9-1- 1/EOC as Emergency Operations Coordinator where he was responsible for investigation and quality assurance of 911 call-taking and dispatch and Pittsburgh’s emergency management program. Our discussion involves all the above and we touch on subject and an incident that still weighs heavy on Ray. Episode 115: Stephen Kavalkovich is the host of a brand new podcast called Rescue The Rescuer. Stephen was a 911 Paramedic who in his career saw and helped those suffering and experiencing tragedy. He was part of a team that went to New York City right after the 9/11 attacks and he tells a story that you won’t believe about the trip from New Jersey to New York on that day. Stephen is a person who knows what it is like to be rescued and saved. He is recovering from substance abuse and PTSD. We discuss his story and how he changed his life around and how Rescue The Rescuer Podcast came about. I recommend after listening our podcast you listen to the first two episodes of Stephen’s http://rescuetherescuer.com. Episode 114: Joseph Zalkin joins the podcast this week. Joseph is the retired Deputy Director from Wake County EMS and his career spans close to 40 years. His career includes being a field paramedic, training and education, teaching and numerous leadership roles. Listen how Joseph goes from Georgia to McDowell County North Carolina to Wake County EMS. We discuss the early days of the Wake County EMS System too. Joseph talks about his EMS teaching experience on the Indian Reservation in Western North Carolina and his research projects. Our discussion leads to EMS and what is occurring in the profession today. If you thought retirement was going to slow him down, it is not and he updates us on what projects he is involved with today. Episode113: The Happy Medic Justin Schorr joins me this week to discuss is blogging and how his podcast called the Crossover Show got started. It is an interesting tale and you will be surprised how he meet his co-host. Justin has over 25 years in the fire service and his entry into EMS is a good listen. He is a Paramedic Captain and works at one of the busiest airports. He starting writing his blog in 2008 and were no subject is off limits. We discuss all of this and his thoughts on EMS. Episode 109: Hawnwan Philip Moy MD, AKA Dr. Phil, is an EMS Physician in Washington University Saint Louis. He is the medical director of the Missouri Division of Arch Helicopter EMS Service as well as Co-Medical Director of Christian Hospital EMS. He is the one of the hosts and the editor of NAEMSP’s Prehospital Emergency Care Podcast. Dr. Moy explains how he “fell” into podcasting. Dr. Moy had no interest in becoming a physician or emergency medicine at first. Listen to what changed his mind, his great experience as had as a Fellow in Emergency Medicine at University of North Carolina. Dr. Moy has a great appreciation for EMS, Paramedics, EMTs and the Wake County EMS System. Episode 1: Paramedic and FTO Greg Edwards is my first guest. Part 1 of our chat learn how Greg decided to become involve in EMS. I hope you enjoy. Episode 2: Paramedic Edwards part 2 of our conversation. Episode 3: Dr. Jefferson Williams is my guest. Dr. Williams is the Deputy Medical Director of the Wake County EMS System. Episode 4: This is a short podcast as I talk about Paramedic Sal Ramirez’s unexpected death and his beginnings at Cary Area EMS, followed by the tribute by the Wake County EMS System End of Watch. Episode 5: Jeff Hammerstein is the Chief of Community Outreach/EMS from Wake County EMS and discusses his career and how the unique way he became the system’s PIO. Episode 6: Cary Area EMS’s Division Chief Tammy Patton Tammy hails from Kentucky and learn how she made it to North Carolina and her path to Cary Area EMS. Episode 7: There are people in your career that play an important role. Todd Stout was one for me. I met Todd when I was working for the City of Pittsburgh and was looking to advance my career. I hope you enjoy our conversation. I did. Episode 10: Dr. Walt Stoy gave me my first teaching job in EMS at the Center for Emergency Medicine. Doctor Stoy is internationally renowned for his efforts in EMS and Emergency Medicine and is recognized by his peers and colleagues as a groundbreaker and national leader in the field of EMS education. Episode 11: Steve Wirth is a founding partner of Page, Wolfberg & Wirth, LLC and is one of the best known EMS attorneys and consultants in the United States. Listen and learn about Steve’s first encounter with the great Jim Page. Episode 12: Justine Hollingshead is a volunteer and an Officer at Cary Area EMS. Justine wears many hats at Cary Area EMS. When she is not volunteering, she is the Chief of Staff for the Vice Chancellor and Dean of Academic and Student Affairs at North Carolina State University. She just received a prestigious 2015 Governor’s Award For Excellence. Episode 13: A.J. Heightman, MPA, EMT-P, is the Editor-in-Chief of JEMS, the Journal of Emergency Medical Services. See how Jim Page and AJ met as well as learning about AJ’s roots in my home State of Pennsylvania. Episode 14: Marion Houle is an EMS veteran and a Division Chief at Cary Area EMS. Marion grew up in Canada and made is way to South Florida then to North Carolina. Listen to his adventure and how he began is EMS career. Episode 15: Bradley Wilson is an award winning photo journalist, college professor and was a great volunteer for Cary Area EMS. Episode 16: Steven J. Davidson,MD is one of my mentors talks about his journey in EMS and Emergency Medicine, the birth of a speciality and EMS in Philadelphia. Episode 17: Chief Tant is a veteran of the Wake County EMS System and he kicks off 2016’s Medic2Medic Podcast. Episode 18: Joe Bourgraf is the CEO of Ferno. See how Ferno was started and learn about the new Integrated Patient Transport Systems coming to EMS. Episode 19: Mike Yee and I worked the busiest Medic Unit in the City of Pittsburgh. We reminisce about our days on Medic 5 and the closeness that partners have together. Episode 20:Chris Colangelo is the Chief Operating Officer for Wake County EMS. Chris’s path to this position starts outside Hampton Roads VA and hear how he makes his way to North Carolina and Wake County. Episode 21: Greg Friese, MS, NRP, is Editor-in-Chief of EMS1.com. He is an educator, author, paramedic, and marathon runner. We talk about how EMS1.com got started as well as a hot button topic as ballistic vests for EMS providers. Episode 22: David Lindell has over 40 years of EMS experience as a provider, educator, flight medic and leader. Listen to his story of being part of Freedom House Ambulance Service and part of the first class of Paramedics to be hired by the City of Pittsburgh. Episode 23: Dr. Paris is a pioneer in EMS, an innovator and one of the biggest supporters of EMTs and Paramedics. He also has a strong opinion on where EMS is going. Dr. Paris a long with Dr. Ron Stewart were a crucial in the early success of the City of Pittsburgh Bureau of EMS. I finally get a chance to say thank you to Dr. Paris for something he did for my family. Episode 24: Kevin Hazzard worked as a paramedic from 2004 to 2013, primarily at Grady Hospital in Atlanta. He is the author of A Thousand Naked Strangers. The book provides an inside look into Kevin’s journey in EMS. We talk about his transition from journalist to Paramedic and his thoughts on EMS today. Episode 25: Jon Olson is the Deputy Director, Chief of Operations for Wake County EMS. Jon has 28 years of EMS experience that included being a former Chief of Cary Area EMS. A few years back a Tornado struck Wake County and Jon was right in the middle of the operation. Listen to him describe his thoughts and the story behind this incident. Jon grew up in Western Pennsylvania and is a Steeler fan. Episode 26: Peter Dworsky and I went to Hahnemann University (now Drexel University) and graduated from their EMS Degree Program. We talk about those early days of the program, his career path and interest in safety for EMS providers. For the past 12 years Peter has been working for MONOC Mobile Health Services in New Jersey as the Corporate Director of Support Services. He also spent 18 years working as a field paramedic in New York City. He is also a two time recipient of the JEMS EMS 10 Innovation Award. Episode 27: Doug Widmer is a Paramedic and Deputy Chief at Medical Rescue Team South Authority (MRTSA) in the South Hills of Pittsburgh. Doug knew when he was 5 that he wanted to be in EMS and he has the proof. Listen to how he got started as a volunteer, being a dispatcher at 16 and how his career path landed him in my old office at MRTSA. Episode 28: Alexander Garza MD, MPH is the Associate Dean for Public Health Practice and and Associate Professor and Chair of the Department of Environmental and Occupational Health (EOH) and is board certified in Emergency Medicine. In addition, he is the Medical Director and Homeland Security advisor for FirstWatch Inc, a data and quality improvement software company in Encinitas, CA focusing on emergency responders. Dr. Garza was appointed by President Obama as the Assistant Secretary and Chief Medical Officer at the Department of Homeland Security. He is a Colonel of the US Army Reserves. Episode 29: Medical Rescue Team South’s Paramedic David Terkel is my guest. David is longtime resident of Mt. Lebanon, PA and started serving the community in 1995. He is part of the Allegheny County HMMR (HazMat Medical) team. The team is the medical support for the county HazMat team. David and I discuss numerous topics, which David has some strong opinions and thoughts. We talk about him being assaulted and how he handled the aftermath. Episode 30: Randolph Mantooth and the TV Show Emergency has influenced countless of people to become EMTs, Paramedics and Firefighters. I am one of those countless people. For our 30th Episode, I was lucky to have him as a guest. Mr. Mantooth is a well known speaker at conferences and advocate for EMS and the fire profession. Mr. Mantooth and I talk about his acting career, how he was selected to play Johnny Gage, the impact of the show, his relationship with Kevin Tighe, an inside look on of the production and set of the show. Mr. Mantooth also provides his thoughts on the state of EMS today and his thoughts on a reunion show. Episode 31:Dan Swayze is the Vice President and Chief Operating Officer of the Center for Emergency Medicine of Western Pennsylvania and is widely considered one of the earliest pioneers of community paramedicine. Dan has been in Emergency Medical Services and has been involved in EMS for more than 30 years. In addition to receiving several local and state EMS awards, in 2014 he received national recognition by JEMS and Physio-Control as an EMS10: Innovators in EMS award for his work with the CONNECT Community Paramedic project in Pittsburgh. Episode 32: Gene Lambert retired after 31 years working for Wake County EMS. In those 31 years, Gene held different positions from Paramedic to Training Chief. Gene’s dedication to public service was spurred by the tragic death of his sister, a nurse, when he was 12 years old. Listen to Gene’s stories on how he went from law enforcement to EMS and arrived first at an airplane crash. We also talk about his days when he was the Chief of a Rescue Squad and how he became the Chief. Episode 33: Lynn Nowak is a paramedic and volunteer for Cary Area EMS. Lynn has been volunteering with Cary Area EMS since 1995. Listen how a different subject path in school guided her to EMS. We talk about how another service missed out on her sprit to volunteer and how Cary Area EMS gained a dedicated volunteer. Episode 34: Mike Taigman has over 41 years working as an EMT, paramedic, QI manager and General Manager. He is currently the Improvement Guide for FirstWatch Solutions. Mike has written over 600 articles and published a book on EKG interpretation. Mike has taken his leadership and QI abilities all over the United States, Canada and the Middle East. We talk about our connection toTodd Stout and similar career paths as well as other interesting topics in EMS. Episode 35: Jonathan Washko as been involved in the EMS industry for over 30 years and has held progressive leadership position with small, medium and large EMS systems in government. Mr. Washko is considered the leading industry expert on EMS system design, High Performance EMS concepts and Industry Best Practices. Jon was one of my classmates at Hahnemann and knew from the first time I met him that he would great for EMS. Episode 36:Todd Pritchard is the Chief of Medical Rescue Team South Authority, an EMS agency serving six communities just south of Pittsburgh Pennsylvania. Todd began his career with MRTSA as a volunteer in 1985 after graduating from California University of Pennsylvania. Todd was promoted to Chief of MRTSA in 2007. We talk about his journey to from being unsure if EMS was the right path for him and how he became Chief. We talk about the challenges that are facing EMS today. Episode 37: Dr. Winslow is the State EMS Medical Director for North Carolina. We talk about how he became the Medical Director, protocols and the responsibilities of this position. There is a strong emphasis on collaborating and involving stakeholders in the process of EMS in North Carolina. Dr. Winslow’s main goal is to help insure high quality of emergency care to the people of North Carolina. Episode 38: Kris Kaull is a serial entrepreneur with over 20 years of experience in public safety both as a clinician and business professional. Kris was the founder of EMS1.com. Kris began his career in public safety as a firefighter and EMT. Kris is passionate about EMS and technology and you can hear this during our conversation. We talk about leadership qualities and you will be surprised about quality Kris thinks is the most important. We also talk about what gets Kris’s creative juices going. Episode 39: Christopher Stawasz is AMR’s Regional Director for New Hampshire and Maine. Christopher was born and raised in New Hampshire and was one of the first practicing paramedics in the state. We talk about the opioid crisis that is hitting New Hampshire and how EMS is combating the epidemic. There is a program in New Hampshire to place Narcan in the schools. Listen to how the EMS crews handled the change in allowing non EMS persons administer Narcan. Episode 40: Mike Prevatte is a Division Chief at Cary Area EMS. Mike started out as a volunteer for Cary Area EMS in 2003. His journey and interest in EMS started way before when he was Boy Scout. He is an Eagle Scout too. Mike Prevatte’s journey from Eagle Scout to Division Chief is an interesting story. Besides heading up Cary Area EMS’s Training Division, being a Shift Supervisor, he also serves as a Tactical Paramedic for the Wake County EMS System. Episode 41: Skip Kirkwood currently serves as the Director of Emergency Medical Services and Chief Paramedic in Durham County North Carolina. He has been involved in EMS since 1973, as an EMT, paramedic, supervisor educator, manager, consultant, state EMS director, and chief EMS officer. A frequent speaker at regional and national EMS conferences, Skip is an Adjunct Associate Professor of Clinical Research and Leadership at the George Washington University School of Medicine and Health Sciences. We talk about his Navy beginnings and how the Field Training Officer Program came about. Episode 42: If you every wondered if you could be in EMS and be an entrepreneur then this podcast is for you. Jayme Burgman joins me this week to discuss his EMS career and how he went from Paramedic to entrepreneur. Jayme has a history in both entrepreneurial ventures and corporate executive management roles requiring high-level expertise in business development, operations and finance. We also talk about the on-going battle on who had the busiest ambulance in the City of Pittsburgh (Medic 5). Episode 43: William Miller has experience in the provision of EMS, EMS Education,fire and rescue services that now spans more than 40 years. Bill’s start was in small town in Pennsylvania to a career with the City of Pittsburgh Bureau of EMS to his current position as Physician Assistant. Bill is also one of the nicest person you will ever meet. Bill and I met when I was hired by the City of Pittsburgh and he was one of the Training Assistants who had to teach us everything from the culture of the City EMS to climbing up and down bridges. With me it was a challenge for Bill and his partner Roy Cox. I had no experience in rescue or climbing. Listen to Bill and I talk about those days as well as Bill’s first experience as volunteer firefighter and the impact it has had on his life. Episode 44: Paul Falavolito is the Chief of White Oak EMS outside of Pittsburgh. Chief Falavolitio begin his EMS career at Medical Rescue Team South Authority in 1997. Chief Falavolito is an innovator leader with numerous successes during his career. He created a state certified wilderness Search and Rescue Team and has authored articles that have appeared in public safety magazines. Besides being a professional photographer (listen how Garth Brooks played a role) one of his bold new projects is Faces of EMS. This project is a wall exhibit of current EMS providers, which is being used for awareness and to celebrate the field of EMS. Chief Falavolito is also the host of his own podcast called EMS Talk, which launched a few weeks ago. Episode 45: Lisa McDougall knew when she was 7 and had freak accident that she wanted to be an emergency medicine physician. Listen how EMS became her career path. Lisa is an Advance Practice Paramedic (APP) for Wake County EMS and the Wake County EMS System. Besides being an APP she is on the PTSD team and you will find out how she helped me and Cary Area EMS through a difficult time when Paramedic Ramirez died suddenly. You can her during our conversation the passion Lisa has for EMS and the APP Program. Episode 46: Do we need to wear gloves with every patient encounter? Is EMS education behind the times when it comes to educating EMTs and Paramedics regarding infectious diseases? You came to the right podcast for answers. Katherine West joins the podcast and we talk about all kinds topics related to infectious disease. Katherine West has been working in the field of infection control since 1975. She lectures both nationally and internationally on this topic. She has served as a consultant to the Centers for Disease Control and the National Institute of Occupational Safety & Health. She is the author of Infectious Disease Handbook for Emergency Care Personnel, now in its third edition. Episode 47: What would it be like to be put in charge of an EMS department of a major city at the ripe age of 24? My guest Jay Fitch had this honor and listen how this came about and the challenges he faced. Jay is the Founding Partner and President of Fitch and Associates and host of the Pinnacle EMS Leadership and Management Conference held in July. Jay is internationally recognized for leadership as a consultant, educator and innovator in the fields of EMS and public safety. We talk about his start in EMS, his journey to being one of the first paramedics trained in the USA, his leadership style and his mentors. Episode 48: Daniel (Danny) Cline is my guest and his EMS career began as an EMT in 1988. Danny has been a provider, educator, trainer and chief. You name a position in EMS, Danny has done it. He is respected among his peers as a medic, educator, chief and hockey player. We discuss his path from the north to the south. He tells a story that he said he has never told anyone. Listen how he came to Cary Area EMS and find out why he is so focus on learning everything he can. Danny is currently a Critical Care Paramedic at Rex/UNC Healthcare. Episode 49: Baxter Larmon is a Professor of Medicine at UCLA School of Medicine and the Director of UCLA’s Center for Prehospital Care. After 35 years at UCLA, Baxter is retiring on July 1. Baxter has long history of EMS service and loves research and education. We talk about his astonishing career, some of his mentors and what he will doing next. Episode 50: Dr. Bryan Bledsoe is an emergency physician, researcher and EMS author. He is Professor of Emergency Medicine at the University of Nevada School of Medicine in Las Vegas. He is the author of numerous EMS textbooks and has over 1 million books in print. We talk about what is like to be an ER physician in Las Vegas and a few interesting cases he has seen. We discuss the state of EMS today and his view of Community Paramedicine. Episode 51: Michael Gannon began his EMS career in 1979 as a volunteer at Medical Rescue Team South Authority (MRTSA). In 1981 was hired as a full time Paramedic. Today he is the EMS Program Coordinator at Allegheny General Hospital. Mike is an award winning educator, a patient’s and Paramedic best friend with his skills and knowledge. During our conversation learn how I played minor role in Mike’s move from MRTSA to his current position. Mike also talks about his first call at MRTSA that you will want to hear. Episode 53: Harold Cohen before retiring from Baltimore County Fire had 35 years of experience with the County and 22 years as Division Chief for EMS. Harold since retiring from the Baltimore County, continues his ability to educate and train new leaders in EMS as a college professor and educator at the National Fire Academy. When he is not teaching he is a Senior Project Manager for SPC/TriData. Harold discusses his early interest and start in the public safety arena. We have a great discussion about leadership and what leaders of EMS should be thinking about today. Harold and I talk about the mentor he was (and still is) to me early in my career and what it meant.Episode 54: Mike Kobneck is President of Novum Concepts Ltd. Mike has developed an APP called BioPhone that capture images and securely send them to a base client such as an Emergency Room from the field. Before the business side struck Mike, he was a paramedic with Denver Health and AMR. We talk about why he developed and how BioPhone works as well as what led him to leave the field to create the APP? His focus is to improve the quality of systems and tools used by paramedics. Episode 55: William Sukitch is a Paramedic with over 24 years of experience in EMS. His path to EMS started while in college. We talk about his early days in EMS and what drove him to join the Navy. In the Navy, Bill was a combat medic. Bill talks openly about about those times and the affect his career in the military had on him. The PTSD that he experiences and how he handles it hopefully will help others. Bill met his wife at Medical Rescue Team South Authority (I had a small part in this), and is a full time Paramedic at Medical Rescue Team Authority. Episode 56: Mic Gunderson has over 40 years of experience in EMS, leadership and clinical roles. Listen how he goes from a film and photography interest as a career, to the military to EMS. It is a great story. He is currently the Director of Clinical Systems in the Quality and Health Technology Division of the American Heart Association. Mic has authored numerous journal articles. Mic and I meet way back when I was working in Philadelphia, which we touch on during our conversation. See how many people in our careers that we have in common that have influenced our careers. Episode 57: Deborah Stein has 24 plus years in EMS and currently is an Instructor at the University North Carolina teaching the AHA programs. Before joining UNC, Deborah was a member of my officer corps at Cary Area EMS. She was Shift Supervisor, headed up our Training Department and was a Division Chief. We discuss those beginning days of my tenure, which you will find very interesting. We talk about Cary Area EMS, her beginnings in EMS and the changes at Cary Area EMS. Episode 58: Dr. Bill Atkinson was one of the first paramedic students in North Carolina. Bill has held several leadership roles in and out of EMS. He has held numerous President and CEO positions in healthcare, with his last being at WakeMed Health Hospitals in Raleigh, NC. Bill sits on the NC EMS Advisory Council and is an active consultant. We talk about his early days in EMS and how he chose to move toward hospital leadership rather than EMS, though EMS was never far from his reach. We also discuss his unique leadership style and why he is a strong EMS advocate. Episode 59: Rick SyWassink is an experienced individual with over 30 years experience in death investigation, forensic science, and autopsy protocol. As well as 15 years of adjunct and full time teaching experience at the college level. We discuss crime scene management by EMS, we touch on the violence that is occurring within the EMS community and he takes us through a murder case that took years to solve. Episode 60: Wendell Hissrich is the Public Safety Director for the City of Pittsburgh. Wendell’s experience includes EMS, Fire and Law Enforcement. His career path includes the City of Pittsburgh Bureau of EMS and many years in the FBI. While in the FBI, Wendell was involved with strategic management of the FBI’s Weapons of Mass Destruction (WMD) program for field coordination in the 56 field divisions with a focus on WMD operational response and investigations, both domestically and internationally. We talk about how the FBI integrated EMTs and Paramedics into the agency. We discuss the challenges he faces as the Director and our connection to Medic 5. Episode 61: One of the most difficult topics this podcast has discussed. The suicide problem that is occurring within the EMS profession. This week’s I talk with the founder of the Firefighter Behavioral Health Alliance (FBHA) Jeff Dill. FBHA is dedicated to educating EMS, Police and Fire on suicide awareness. It is the only known organization that collects and validates data on FF/EMT suicides across the Unites States. Jeff besides being a retired Fire Captain holds a MS in Counseling.Suicide of Public Safety Providers, especially in EMS unfortunately is in the news on a regular basis. Just this week EMS1.com ran another article on the subject. We discuss how the organization got its start. We talk about suicide in EMS, what are some of the signs we should be looking for and how important that we educate our public safety family. Victims Unit for eleven seasons. Dr. Baer was also a Writer and Producer of the NBC hit series ER for its first seven seasons, where he received five Emmy nominations as a producer and two for writing. We discuss how he goes from Medical School to ER. We talk a lot about ER and how the ideas for that show came about and how the medicine goes from the written pages to the actors and how it looks so real. Dr. Baer gives an inside look on how medicine and TV work. Episode 63: Amy Eisenhauer started her EMS career in 1995. Her entrance into EMS is unusual and a good story. Amy is contributing author for EMS World magazine and has an interactive blog on EMS at TheEMSSiren.com. She speaks nationwide on subjects like hoarding, career development and provider wellbeing. We talk about all of the above and how her blog and writing started (another interesting story). Amy likes to teach and educate on different EMS subjects. Amy will be a Speaker at the North Carolina EMS State Conference this October. Episode 64: Sgt Eric Sweden from the Raleigh Police Department joins me this week. Sgt Sweden is our first police officer to be on the podcast. We talk about the training he did for the Wake County EMS System regarding verbal judeo. Before we get to that topic we banter about his beginnings in public safety. Sgt Sweden was a firefighter, EMT and Paramedic. He even worked as a Paramedic for Wake County EMS. You can tell Sgt Sweden is passionate about his career choices and he tells us about two patients that had an impact on him. Our other topics include violence to EMS providers, we touch on ballistic vests and a few pointers on how to deescalate a scene and safety for EMS providers. Episode 65: Dr. Jose G. Cabanas is a board-certified emergency medicine and EMS physician with a particular expertise on prehospital systems of care, continuous quality improvement and resuscitation. Dr. Cabanas is the incoming Director/Medical Director for Wake County EMS in Wake County, North Carolina. Dr. Cabanas currently serves as a member of the National AHA ECC Systems of Care committee and Mission Lifeline Resuscitation Committee. He also serves as Member-at-Large for Board of Directors NAEMSP. In addition to his interest in the practice of prehospital medicine, Dr. Cabanas has an interest in clinical research and regularly publishes scientific articles on a number of topics in EMS, Emergency Medicine and Resuscitation.We discuss his early interest and start in emergency care, his leadership style and Dr. Cabanas reveals a few unknown facts about himself during our conversation. We discuss what is upcoming in EMS as well as in the Wake County EMS System. Episode 66: Steve Daniels is the co-anchor of ABC11 Eyewitness News at 5:00 pm, 6:00 pm, and 11:00 pm Monday-Friday. Steve also anchors ABC11 Eyewitness News at 10 pm weeknights on CW22. In addition, Steve anchors Breaking News coverage from the Breaking News Center. Steve joined ABC11 Eyewitness News in June, 1999. Before coming to WTVD, Steve was a correspondent for “Dateline NBC”. Steve traveled the country and the world interviewing newsmakers and reporting stories for the national newsmagazine program. Steve also appeared on the “Today” show, “NBC Nightly News”, MSNBC, and CNBC. We talk about how the news covers public safety? How public safety is treated in the media? We discuss where he was during 9/11. Steve provides us with a behind the scenes look on story development and breaking news. We have fun talking his first job as a reporter and where he went to school to study journalism. Episode 67: Ryan Stark is an associate attorney with Page, Wolfberg & Wirth. His concentration is with HIPAA, Labor, Medicare reimbursement and related areas of the law that affect the EMS industry. Our discussion surrounded the use of Body Camera use within the EMS community. Ryan answers the question that comes up any time you mention Body Cameras and EMS: Is it a HiPAA violation? The discussion leads to the pros and cons of body camera uses by EMTs and Paramedics. If you are Chief or Administrator, what do you need to set up a Body Camera program in your organization? How do you get the “buy in” from your staff and the public? Ryan answers these questions and more. Episode 68: What do do when you mix a pilot and paramedic? Drew Baird is the answer and he is my guest this week on the podcast. Drew always wanted to put his passion of flying and EMS together and he knew it way back when in high school. Learn how this all began as well as Drew talks about his first call in EMS. We discuss his new venture Vector AeroMed. This aeromedical company flies patients all over the eastern 2/3 of the United States, Canada, Caribbean and Latin America. Through a partnership with Children’s Flight of Hope, Vector AeroMed provides a great number of trips to kids traveling for specialty treatment of various illnesses free of charge to the families. We talk about Drew’s entrepreneurial spirit and his love of teaching within the EMS community. Episode 69: Everitt Binns has 50 years of EMS experience. That is a lot of years and time in this profession. He has held all positions and he is currently the EMS Chief for Grand View Health is Sellersville Pennsylvania. HIs experience as a leader, executive and professor has provided his employees, students and the EMS world with a wealth of knowledge and teachable moments. Ev as he likes to be called was one of my professors at Hahnemann University (now Drexel) and provided me with not just education, but lots of wisdom. We discuss Ev’s leadership style, how he got into EMS, what I was like as a student and many other topics. Episode 70: A Special Pink Edition of the podcast. A year ago our friend and colleague from Cary Area EMS Division Chief Tammy Patton was diagnosed with breast cancer. Tammy joins me for a second time on the podcast to talk about her journey, her positive attitude and how the EMS community rallied around her. Check out this album of the fundraiser held for Tammy. Episode 71: David Page, MS, NRP, is the director of the Prehospital Care Research Forum at UCLA and field paramedic with Allina EMS in the Minneapolis/St. Paul area. He is an adjunct Senior Lecturer and PhD candidate at Monash University in Melbourne, Australia. David was awarded the prestigious Minnesota State Colleges and Universities Educator of the Year in 2011. He was also recognized as one of the 2012 EMS 10 Innovators for his role in creating the Saint Paul Fire Department’s EMS academy and Freedom House BLS unit. We discuss all the above and more. David is my third Eagle Scout to be a guest on the podcast. Is there a correlation between scouting and EMS? We talk about his first EMS call, which is one heck of a first call. David mentions what it was like to meet James Page for the first time. There is a great conversation about diversity and EMS. Episode 72: It is the night before Halloween and simulation is the name of the game. Is practicing and pretending is a good way to learn? We will find out. Amar Patel is the Director of the Center for Innovative Learning at WakeMed Health and Hospitals in Raleigh, North Carolina. He is responsible for integrating technology-based education to include human patient simulation, healthcare gaming, and hybrid learning methodologies. Amar is a nationally registered paramedic, firefighter as well as the expert in patient simulations. So everything you want to know about the how, because and why we use simulation in EMS is discussed this week on the podcast. Episode 73: Jason Friesen is the Founder and Director of Trek Medics International. Trek Medics International is a non-profit, humanitarian organization dedicated to developing prehospital and emergency care in low and middle income countries. Jason is a paramedic with entrepreneurial spirit and has been working in international development since 2003. He is originally from the NYC-area and has spent many years living in Central America, the Caribbean and Europe, working for a number of recognized international humanitarian organizations including Project HOPE where he was the Haiti Country Director until mid-2012. We discuss how he got started in EMS and all about Trek Medic International. Jason is using technology (Beacon) in certain countries that allow the EMS providers to use their cell phones to respond to emergencies, ask for more resources and notifying the hospitals. How do you make a pitch to country’s leaders that your organization is the right one for them? Jason answeres this question and more this week on Medic2Medic. Episode 74: Jean Bail is the Director, Disaster Medicine and Management at Philadelphia University. Jean is a dedicated teacher, educator, paramedic, nurse and mentor. If it was not for Jean, this podcaster would of never graduated from college. It was a little EMS program at Hahnemann University, where our paths crossed. I was struggling as a college student up to this point. I was about to start a new job as supervisor in the City of Brotherly Love. Jean accepted me in the EMS Degree program and the rest is history. Jean and I talk about how she got the program started, the early days, the great faculty and her interest in EMS and infection control. We might mention some of my past podcast guests and what kind of students they (me) were like. A good discussion on leadership and education in EMS is included. Episode 75: FBI, City of Pittsburgh EMS, diving the murky waters of the 3 Rivers, and EMS are some of the topics that are on the podcast this week. Kurt Gardner has been in EMS for over 30 years. He became an EMT in 1985 and was a volunteer for Medical Rescue Team South in the south suburbs of Pittsburgh PA. He became a Paramedic in 1987 and was hired as a Paramedic by the City of Pittsburgh in 1988. While with the City of Pittsburgh, Kurt also served on the city’s HAZMAT team and was a Master Diver with the River Rescue. Following the September 2001 attacks, the Commonwealth established an in state Urban Search and Rescue team and the City of Pittsburgh was an integral part of that team. Kurt served as Medical Team Manager. Kurt retired after 21 years in the city to take a position within the FBI to provide specialized medical support. In his current position with the FBI, he is a Weapons of Mass Destruction Specialist. We discuss all the above and how the FBI uses Paramedics in the Bureau. Episode 76: Did you ever look in the mirror and say enough is enough? This week Daniel Mills, a 14 year veteran of the fire and EMS world tells his story about looking in the mirror. Daniel is the founder of 911 Buddy Check. Daniel is a veteran of the US Navy where he served as a Fleet Marine Force Corpsman with the United States Marine Corp for 8 years. He is currently a Flight Medic in Alabama. His story has twists and turns that include difficult subjects like addiction, suicide and PTSD. A dog and mirror play a pivotal role in the unbelievable turnaround of his story and what he does now to help others. Daniel is passionate 911 Buddy Check and making sure the public safety family has somewhere to turn when they are in trouble. His story is incredible and I was honored to speak with him. Episode 77: Gene Starzenski is the Producer and Director of the documentary Freedom House. Freedom House Ambulance was started in Pittsburgh and was the precursor to the City of Pittsburgh Bureau of EMS. Before Gene produced this wonderful documentary, he served as the Medic Advisor and Set Medic on hundreds of television shows and 50 films. Some of his films include The Dark Knight Rises, Transformers: Dark of the Moon, Pearl Harbor and Jaws 2. He started his EMS career in 1971 in Pittsburgh. Please pay attention to Gene’s beginning and how he learned to work the stretcher? Gene is a great storyteller and our podcast includes behind the scenes of some of my favorite television shows and stars. We also learn about the story behind the almost TV Series based on the film Mother, Jugs, and Speed. You will hear his passion, determination and the ups and downs to make the documentary and his EMS career. Episode 78: Cary Area EMS’s own Christian Heinrich joins me this week on the podcast. Christian has over 20 years of service with Cary Area EMS starting as a volunteer and moving up the career ladder to his current position as Division Chief. Christian was not heading towards a career in EMS, but like so many of us he got the “bug”. Christian talks about his early days in EMS and volunteering in Virginia, why he moved to Raleigh and how he ended up at Cary Area EMS? We talk leadership style, he provides insight with the 2001 recruitment of a new chief and jumpsuits. Episode 79: Dr. Spiro is the Co-Founder and Chief Medical Officer of ReelDx. He is the former Fellowship Director and Chief of Pediatric Emergency Medicine at Oregon Health & Science University, Doernbecher Children’s Hospital. Using real patient video, he led efforts to raise 5 million dollars of philanthropy to open the first Pediatric Emergency Department at OHSU in 2009. He received his MD at University of California San Francisco and worked as an Assistant Professor of Pediatrics at Yale University School of Medicine prior to his current appointment at OHSU. Dr. Spiro is passionate about disseminating the use of case-based, flipped classroom learning using HIPAA compliant real patient video. We discuss how Reel Dx came about and how do you receive permission from the patient in an emergency to videotape their illness? Reel Dx is being used in training programs in EMS as well as in Medical School. Episode 80: Eric Bernard is a Pittsburgh, PA native beginning his public safety career as a volunteer EMT in the Pittsburgh suburbs (Swissvale) starting at the age of 15. That is how we meet. Only a few people call me Stevie and Eric is one. In 2004, he was selected as the first executive director for the Montgomery County Volunteer Fire-Rescue Association where he continues today. Eric works directly with the County Fire Chief, County Executive, County Council, and the public representing the needs, efforts, and work of the over 2,400 volunteer, fire, rescue and EMS professionals in 19 local volunteer fire and rescue departments of the County. He served in the United States Navy as a combat airborne medic and emergency/healthcare provider both as a US Navy hospital corpsman and later as a medical officer for eight years, including assignments supporting Operation Desert Storm and Desert Shield. Our discussion goes from how we meet, jumping out of planes, leadership, EMS and much more. Episode 81 Chief Lloyd Parker: The podcast goes international this week as my guest works in Kuwait. Chief Lloyd Parker since June of 2011 has served as the Chief of Emergency Medical Services for the George Washington University Medical Faculty Associates, Department of Emergency Medicine for the US Army Central Command Bases in the State of Kuwait. Chief Parker has served in leadership roles at eleven Type I Incidents (Haiti, Florida Wildfires, Tornadoes, and Hurricanes Andrew and Katrina to name a few). Chief Parker worked on National Security Special Events like the Obama Presidential Inauguration and 4th of July in Washington DC. Our discussion includes how EMS works in Kuwait and the pros and cons on being a Paramedic in Kuwait. We touch on his career, working on the top level security events, leadership style and how he got to Kuwait. Episode 82: Brian Behn is a Critical Care Paramedic in Colorado and is known on the Facebook Page EMSQAQI. You can say that Brian is pro QA/QI and he is a dedicated educator. Brian has spoken at State Conferences, written for EMS1.com and likes to write test questions for a well known EMS review site. Our conversation touches on all the above subjects as well as Brian takes inside a call that every EMS provider can learn from. Episode 83:Episode 83: David Bunnell is a Paramedic whose plan was not to become a Physician Assistant. That changed and he now works as a PA at VA in Washington DC. Dave’s practice experiences include Cardiothoracic Surgery, Surgical Critical Care and Emergency Medicine. Before becoming a PA, Dave was Paramedic (still has his certification in Pennsylvania) and an Organ Recovery Coordinator. Dave is very active in leadership of the Association of PAs as well as peer reviewer for the Journal of the American Academy of Physician Assistants. We discuss how he got his start in EMS, his days at the Center for Emergency Medicine and Medical Rescue Team South. We spend time discussing what it is like in the operating room as PA, team leadership and a work day for Dave. Episode 84: Chris Cebollero is the co-host of EMS1.com’s podcast Inside EMS. The podcast brings expert perspective to EMS topics, clinical issues operational and leadership lessons to EMS personnel. Chris has over 30 years of EMS experience. Chris is an internationally recognized leadership specialist, coach and bestselling author. Chris is currently the Senior Partner of his own consulting firm specializing in Leadership Development, Individual and Executive Coaching, and Organizational Process. Chris has been seen on ABC, NBC, CBS and FOX speaking on the above issues. Our discussion includes his start in EMS, how he and Kelly Grayson became host of Inside EMS, his strong views on leadership and the EMS profession. Episode 85:The podcast goes international once again. This time it is Israel. Mr. Dov Maisel is the senior Vice-President of International Operation for United Hatzalah/Untied Rescue volunteer emergency response organization. He is Combat Medic and a Company Commander (Res.) in the Israel Defense Forces and specializes in a mass disaster, rescue and recovery training for both the civilian and military arenas. He is an innovator and inventor of medical technologies and devices and is on the International Editorial Board of the Journal of Emergency Medical Services (JEMS). Our discussion goes back to Dov’s school days and how EMS was made for him. You won’t believe the number of volunteers that United Hatzalah has responding to emergencies and who those volunteers are. Dov tells a compelling story of a terrorist attack and the unbelievable situation he faced. If you want to know how EMS works in Israel, Dov and I kibbitz (talk) about that subject too. Episode 86: Jane Smith is an EMS expert with over 30 years of experience in both the public and private sectors, including Public Health, Education, the Fire Service and Nonprofit business. She has worked in all ranks up to and including EMS Department head where her responsibilities included QI/QA, education and training, strategic planning and budget management. She has taught for 10 years as a tenured teacher with the Community College. As an entrepreneur, she worked with a number of other professionals to lead a nonprofit community base Paramedic organization to become a premier educational institution to provide a voice for EMS throughout the State of California. Jane is a California paramedic and currently is a Commissioner for the California EMS Authority. She has a MA in Education and a BS in Biology with a minor in Chemistry. Jane has a powerful story about her start in EMS and she talks about the challenges she faced both in and out of EMS. Our conversation covers politics, EMS education, EMS leaderships, EMS in San Francisco and her love for education. Episode 87:Tracy Levesque is a Paramedic in Ottawa,Canada where their EMS system responds to 120,000 calls a year. Tracy is a BLS Paramedic, What is BLS Paramedic,? Tracy will let us know the answer during our conversation. After 26 years on the job, Tracy is breaking a new partner. Max is a Golden Retriever and is the only Therapy Dog in Canada for EMS providers. Tracy provides all the details on how the Dog Program came about, what her colleagues think about Max and what Max has done for Ottawa EMS. Tracy and I also discuss Max’s Twitter ability (yes I follow Max and tweet with him). Besides the Dog Program, we talk about EMS in Canada. Episode 88: Mitchell J. Brown continues his amazing career and journey and we hear his story this week. Mitchell J. Brown’s EMS roots started in Pittsburgh. Freedom House played a significant role for Mr. Brown as a paramedic and leader. Mitchell J. Brown has held a wide variety of roles in the area of Public Safety and executive leadership positions in large government agencies. His passion and his strong commitment to excellence have been the driving force in his more than 40 years of government experience. Mr. Brown was appointed to Columbus City Council on January 11, 2016. As a member of City Council, Councilmember Brown chairs the Public Safety Committee and the Veterans’ Affairs Committee. From 1996-1999, Brown served as the Director of the Ohio Department of Public Safety His accomplishments included adopting “Core Values” for the Ohio Department of Public Safety. Our conversation includes the greatness, the struggles and the politics of Freedom House. Mr. Brown talks about his memories of Dr. Peter Safar. Mr. Brown’s leadership style and our rival high schools, Core Values and his favorite football team are also on the agenda. Episode 89: Kelly Grayson has been a Critical Care Paramedic and EMS Educator for twenty-three years. He is president of the Louisiana Association of EMS Educators and a board member of the LA Association of Nationally Registered EMTs. He currently works as a critical care paramedic for Acadian Ambulance in southwest Louisiana and as the EMS Education Coordinator for ACE4EMS. He is an award-winning columnist for EMS1.com and EMS World Magazine, and co-host of the EMS1 podcast Inside EMS. Kelly’s transition into EMS is an unique one as well he is the author of the column The Ambulance Driver. We discuss how the title and column came about and the criticism the title received. As the co-host of EMS1.com’s podcast, we talk about his co-host Chris Cebollero and how they met. Kelly has an interesting take on the future of EMS too. Episode 90: Neil Jones: When I went to school to become a paramedic, the program was 6 months and there was no EMS degree attachment. This week we focus on EMS Education today with my guest Neil Jones. Neil is the Associate Professor and Paramedic Program Director at Community College of Allegheny College in Pittsburgh. Neil is responsible for development and teaching the curriculum for Paramedic Associate Degree and Certificate Programs. Neil with over 30 years of documented achievement and increasing responsibility in the healthcare environment. Expertise in the areas of strategic planning, fiscal planning, staff development, business plan development, medical education, disaster planning and management, emergency and pediatric emergency medicine. Recognized by peers and other leaders for a positive professional attitude, problem-solving abilities, team dynamics, leadership qualities and a strong sense of organizational commitment, purpose and mission. Neil and I discuss the changing environment in EMS education, his path into EMS and EMS Education, how we met and the future of EMS education. Episode 91: Scott Cravens is the the Group Publisher SouthComm Communications, which publishes EMS World. Scott entered the EMS world after 20 years in a different role in publishing. Scott also sits on the board of the National EMS Museum Foundation. This museum is dedicated to memorializing and commemorating the history of EMS and the people and organizations that provide emergency care. We discuss why Scott got involved in EMS and why he felt that he needed to become and practice as an EMT. We also discuss the competition in today’s world of EMS publishing and information. Episode 92: Paramedic Jaime Redig from Cary Area EMS joins the podcast this week. Jaime traveled an interesting path to come to Cary Area EMS. She has lived in nine states including Alaska and spent time in Sweden. This on it’s own is interesting, but Jaime came to EMS from law enforcement. Jaime tells us how she made this decision, her love for medicine and her experience with online paramedic education. Episode 94: Matthew R. Streger is a paramedic and attorney with more than thirty years of EMS experience. Matthew is a Member (Partner) at the law firm of Keavney & Streger in New Jersey. He has worked in EMS systems in New Jersey, New York, South Carolina and Ohio. He has served as the Executive Director of Mobile Health Services (EMS) at Robert Wood Johnson University Hospital in New Jersey and the Deputy Commissioner of EMS in Cleveland. Matt has interesting take on why EMS providers should apologize to patients and he outlines this during our conversation. Matt and I met while working at Helene Fuld Medical Center in Trenton, NJ. We discuss those days working in New Jersey and how it was like Squad 51, EMS today and his new collaboration with the American Ambulance Association. Episode 95: Bobby Hopewell, a Michigan native brings 29 years of extensive healthcare, leadership and public service experience. Today he is responsible for the day to day operation of Mobile Health Resources. He has a passion for serving and service delivery, especially as it relates to ensuring a positive impact for those being served. Previous to his hospital work, Mr. Hopewell served a combined 13 years in Emergency Medical Services leadership in West Michigan with Life EMS Ambulance, LifeCare Ambulance Service and Gull Lake Area Ambulance. In the early 1990’s Mr. Hopewell successfully led his team at Life EMS Ambulance through the inaugural Commission on Accreditation of Ambulance Services accreditation surveys. This achievement makes him one of the first EMS leaders in the nation to lead an accredited EMS organization. Mr. Hopewell has been a Michigan Licensed Paramedic and is presently Mayor of the City of Kalamazoo. We discuss his entrance into EMS, healthcare, leadership style and how he has uses his EMS experience in the political arena. We have a good discussion regarding employee engagement and their surveys. We talk about how he and his City of Kalamazoo worked through a critical incident. Mr. Hopewell helped Stryker Equipment in their beginning with their yellow stretchers. Listen to how this came about this week on the podcast. Episode 96: Jerry Overton serves as the Chair of the Board of Accreditation for the International Academies of Emergency Dispatch, the organization charged with setting standards, establishing curriculum, and conducting research for public safety dispatch worldwide.Previously, he served as the Chief Executive Officer, Richmond Ambulance Authority (RAA), Richmond, Virginia, for 18 years and had overall responsibility for the internationally acclaimed performance based EMS system. Mr. Overton also served as the Chief Executive of the Kansas City, Missouri, EMS system. As an expert in EMS system design and deployment strategies, he was named one of the 20 most influential leaders in EMS by JEMS magazine. In 2016 he received the Lifetime Achievement Award from the National Association of EMTs and the National Registry of EMTs. We discuss his great EMS history, work in other countries, a few good lessons he learned, his leadership style, Jack Stout and what he is doing now. Episode 97: Lisa Giruzzi and Rob MacCue are the founders of the EMS Leadership Academy. The Academy creates leadership resources for EMS providers to enhance their organization and develop magnetic thriving organizations that people want to be a part of. The Academy’s purpose is to be the source of transformational leadership in Emergency Services. Robbie MacCue has more than 14 years experience in the EMS industry. Currently, he is a flight paramedic NY. For more than 10 years, Robbie has served as President of Sand Lake Ambulance, a non-profit EMS organization in Upstate New York. Lisa Giruzzi is a best-selling author, result-producing consultant and an award-winning trainer with more than twenty-five years’ experience helping individuals and organizations to be more successful and achieve their goals. Our discussion travels their careers, how they met and the creation the EMS Leadership Academy. They both offer great tips for EMS leaders on the issues they face today. Robbie and Lisa are offering Medic2Medic Podcast listeners a chance to receive their book and take one of their courses for free. The code for these resources are revealed in the podcast. Take a listen. Episode 98: Ginger Locke is the creator and host of the podcast Medic Mindset a Paramedic and an Associate Professor of EMS Professions at Austin Community College. Ginger’s podcast is cool and unique as she interviews medics face to face in long, intimate format. During the interviews the medics open up about their mindset, routines, mistakes and their thought process. Ginger started a project called #PartnerProject (#partnerproject) that has gone viral just not in the United States, but Internationally. We discuss #partnerproject and how it came about, the podcast, how did the name Medic Mindset was derived and her beginnings in EMS. Episode 99: This podcast brings up the old as time tale of: Do we need Red Lights and Sirens in EMS? Doug Wolberg is the guest. Doug has been involved in EMS since 1977. He started as an EMS provider and later worked at the county, regional, statewide and federal levels in his career as an EMS administrator. Doug is an attorney and a founding partner of Page, Wolfberg & Wirth, the nation’s best-known and most respected EMS law firm. Doug is an author of several books and hundreds of articles in the industry’s leading publications and has been a featured presenter at EMS conferences. We discuss this well debated topic, his first encounter with James Page and he answers what is the number 1 liability an EMS agency faces. Episode 100: City of Pittsburgh EMS Old Timers Podcast. Robert Farrow, Dave Lindell, Mike Yee and Tim Gaughan join me for a free flowing conversation. We talk about their humbling beginnings in EMS and how they became a Pittsburgh Paramedic.They talk about the good and sad times as well as some stories that may never have been told before. This is number 100 of the podcast, the guests had no idea that this would be number 100 (neither did I at the time). I just want to say a big thank you to all of you for the support to reach this milestone. Here is to another 100! Episode 101: Faces of EMS is a project that was created by Paul Falavolito, Chief of White Oak EMS in Western Pennsylvania. Paul created a wall of EMS practitioners by taking their portraits and displaying these portraits and Faces of EMS was born. Paul joins me to talk about this project. The project is being launched to celebrate the 43rd Annual National EMS Week that runs from May 21-27, 2017. Faces of EMS is being featured on the cover of EMS World Magazine, NAEMT’s website and other areas of EMS as part of the #EMSstrongcampaign. This podcast is dedicated to all those those who are involved in EMS. 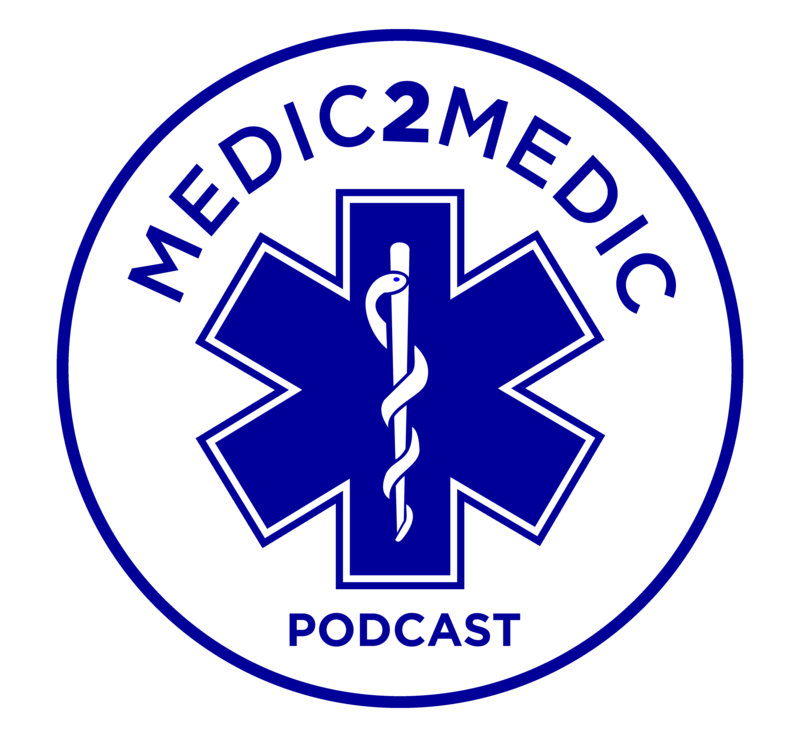 Medci2Medic Podcast wishes you a happy and safe EMS Week. Episode103: Josh Stuart from Medical Rescue Team South Authority (MRTSA) joins me this week to discuss his 25 year journey in EMS. His career started when he was in elementary school, when a visit from MRSTA guided him to becoming a Paramedic. As he got a little older, he started by watching the Emergency! and he never looked back. Josh discusses his persistence to get his career started, as he met some resistance from MRTSA who said he was too young to start volunteering. Josh talks about calls that impacted him as well as the call that he encountered that led him to become a leading educator regarding the”Choking Game” and risky teen behaviors. Josh provides the fantastic details on how MRTSA changed his life forever. Episode 104: Chief Dan DeGryse from the Chicago Fire Department joins the podcast this week. Chief DeGryse has 28 years with CFD and holds the rank as Battalion Chief/EMT. What is unique about Chief DeGryse is that he is the Director of the Rosecrance Florian Program. Rosecrance is a leading provider of behavioral health services with nationally recognized addiction treatment programs. Rosecrance is a place for veterans and public safety providers can go to who need help.The Chief shares his start at CFD and his career path. He shares his personal story and how that led him to become the Coordinator of the Chicago Firefighters’ Union Local 2 Employee Assistance Program for 14 years. You will hear during our conversation the importance of firefighter and EMS mental health, emotional wellbeing, peer support and sleeping. We have to many of our public safety family committing suicide or not seeking help, Chief DeGryse is here to help, just give him a call. Episode 105: Chief Robert Farrow is the Chief of the City of Pittsburgh Bureau of EMS. Chief Farrow was also my Supervisor when I worked for the City. Chief Farrow is a 41-year veteran with the City of Pittsburgh Bureau of Emergency Medical Services. Chief Farrow has held the position of Chief since May 2016. Chief Farrow is one of three remaining Bureau of EMS employees who started with Pittsburgh EMS upon its inception back in June 1975 at the age of 19. Chief Farrow has held the rank of Paramedic, Crew Chief, Supervisor/District Chief, Rescue Division Chief and Deputy Chief. The Chief and I discuss his start in EMS in high school, the challenges of being a chief, what it was like in the beginning days of EMS in Pittsburgh and a little bit about how it was to supervisor me. Episode 106: Episode 106: Brett Schneider is the the host of the podcast Words Off The Street. Brett talks to guests that write, talks with authors, podcasters, writers and bloggers that put the proverbial pen to paper about the world of Police, Firefighter and Emergency Medical Services about what’s going on out in the street. Brett’s professional career spans a collection of careers, starting in the Army in the mid-1980s. He has worked as a policeman, a paramedic, a Safety Manager and many other positions. He says he basically didn’t know what he wanted to be when he grew up.Brett and I talk about his interesting career at New Orleans EMS, the books he has written (he is currently working on his 4th book), the podcast and many other topics. Episode107: Mark Wilcox is the Senior Manager of Security for SAS Institute where he coordinates the enterprise’s physical security and responses to emergencies.This includes oversight of proprietary and contract security teams, company police and a Global Security Operations Center (GSOC). SAS Institute is the world’s largest privately held software company.SAS employs nearly 15,000 people with about 75 offices in over 50 countries. Mark works from the 450-acre corporate headquarters campus in Cary, NC. Mark brings 20 years in public safety and has held numerous positions within the sector. Mark is a fast learner as well as he is very creative as he defined and created numerous firsts during these 20 years. Mark came to Cary Area EMS as a volunteer paramedic and today he is one of the Board of Directors. Our discussion includes making sure that 15,000 employees stay safe, being the first paramedic for an organization and how he ended up at Cary Area EMS. Episode 108 is Alex Pollak: Alex is the President of ParaDocs. ParaDocs is a global event medical providers with over 1,600 medical professionals nationwide including doctors, nurses, paramedics and EMTs. It is designed and implemented mobile emergency triage/treatment tents for large events across the country. Alex’s path to creating ParaDocs goes through being a street medic in New York City, obtaining his MBA and his entrepreneurial spirit. As a paramedic, Alex was part of the EMS response to the 9/11 attack and Miracle on the Hudson. We talk about both these incidents, ParaDocs creation and the need for venues to have EMS and medical personnel at their events. Alex also speaks about taking chances and leadership. Episode 110: Don Garner is a nationally registered paramedic with over 20 years of pre-hospital and critical care experience. He is currently the Deputy Director of Professional Development for the Wake County EMS System. Assuming the role in 2013, Donald is responsible for all aspects of education and training for the EMS System. Don is a published author, researcher and lecturer on pre-hospital medicine and education topics. He is also an adjunct instructor for the Department of Emergency Medicine at the UNC School of Medicine. Our discussion starts with his early beginnings and interest in helping people, to his days as a volunteer at Garner EMS and coming to work in the Wake County EMS System. We have a great a discussion about the current and future challenges of education in EMS. Episode 111: Jessie Senini is a clinical research paramedic and recovering art student with more than a decade of EMS experience with private, municipal and federal EMS agencies. Jessie is the creator and artist of the comic strip “White Shirts” on EMS1.com. Jessie traveled across the country to live in Louisiana, a state with no snow, Jessie now draws from her experiences on the truck to bring humor and awareness to life and issues surrounding emergency services. Jessie truly believes that laughter is the best medicine and hopes to continue to treat those around her through comics. Our discussion starts off in Montana and we travel to New Orleans with this starving artist on her adventure into EMS. Jessie shares with us her stories about joining New Orleans EMS and a day that changed her path in the profession. We talk about the effects of stress and burnout had on her. If you have not seen her comic strip, I highly recommend you take a look. She also has a fantastic laugh.